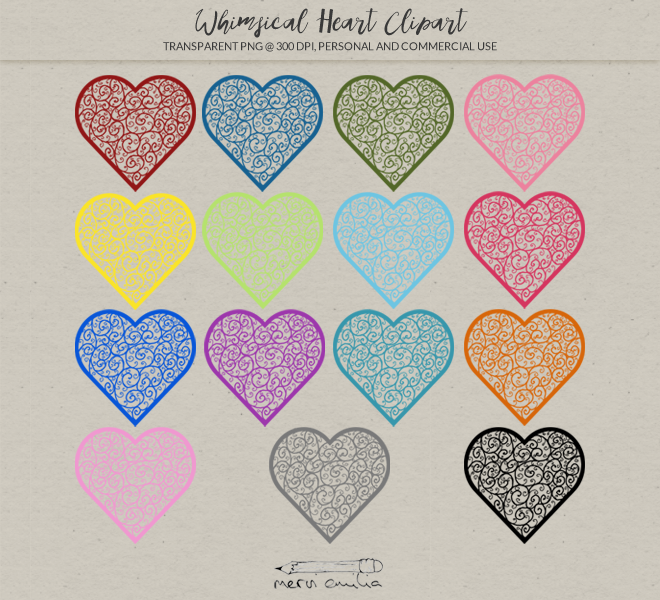 Whimsical heart clipart in 15 bright colors. High resolution, transparent PNG files (300 dpi/2500 x 2500 px). For both personal and commercial use (TOS). Whimsical heart clip art for personal and commercial use. Perfect for different purposes, such as scrapbooking and journaling, web design, Christmas cards and tags, Valentine's cards and other greeting cards, gift wrapping and much much more! The clipart you have purchased are for both personal and commercial use. The clipart can be used as part of web images and graphics. You may use the clipart you purchased within your own design, painting etc. You may distribute (including commercially) the design, painting etc. which you have created with using the clipart you purchased. You may NOT reproduce, redistribute, give away or sell the clipart or modified versions of the brushes or parts of them in any form or way, including as brushes, clip art, or on one color or transparent background.